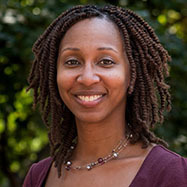 Wingfield's research focuses on the ways everyday patterns in professional workplaces can maintain racial and gender inequalities. In particular, she is an expert on the workplace challenges facing black men in jobs where they are in the minority. Her work has implications for labor policies, racial and gender inequality, and diversity initiatives. "Abandoning Public Education Will be Considered Unthinkable 50 Years from Now," Adia Harvey Wingfield, Vox, April 3, 2019. Adia Harvey Wingfield's research on the experiences of black professionals discussed in Jasmine Harris, "The Emotional, Uncomfortable Classroom," Inside Higher Ed, May 11, 2018. Adia Harvey Wingfield's research on Aamna Mohdin, "For Black Women, Femininity and Feminism are not Mutually Exclusive," Quartzy, January 6, 2018. "Racism is Stopping Black Men from Solving Our Nursing Shortage," Adia Harvey Wingfield, Slate, November 27, 2017. "About Those 79 Cents," Adia Harvey Wingfield, The Atlantic, October 17, 2016. Guest to discuss a new study finding a greater racial wage gap in 2015 than in 1979 on All Things Considered, Adia Harvey Wingfield, October 16, 2016. "The Professional Burdens of Being a ‘Model Minority’," Adia Harvey Wingfield, The Atlantic, June 6, 2016. "The Unique Tensions of Couples Who Marry across Classes," Adia Harvey Wingfield, The Atlantic, April 5, 2016. "Dear CEOs, Those Campus Racism Protests May be Coming to Your Office," Adia Harvey Wingfield, Fortune, March 6, 2016. "Segregation Today, Segregation Tomorrow, Segregation Forever," Adia Harvey Wingfield, The Atlantic, February 4, 2016. "How ‘Service with a Smile’ Takes a Toll on Women," Adia Harvey Wingfield, The Atlantic, January 26, 2016. "The Plight of the Black Academic," Adia Harvey Wingfield, The Atlantic, December 15, 2015. "Being Black - but Not Too Black - in the Workplace," Adia Harvey Wingfield, The Atlantic, October 14, 2015. "Canaries in the Coal Mine? Saida Grundy, Zandria Robinson, and Why Calls for their Firing are a Problem for Everyone," Adia Harvey Wingfield, Work in Progress, Organizations, Occupations and Work, July 8, 2015. "Unintentional Sexism in Tech," Adia Harvey Wingfield, Work in Progress, Organizations, Occupations and Work, May 11, 2015. "Federal Jobs Report, MSNBC Story on Black Underemployment Ignore Data on Discrimination," Adia Harvey Wingfield, Work in Progress, Organizations, Occupations and Work, February 23, 2015. "Gendering #BlackLivesMatter," Adia Harvey Wingfield, Pacific Standard, December 18, 2014. "Rand Paul Exposes the Dangers of Colorblind Thinking," Adia Harvey Wingfield, Racism Review, May 22, 2010. "Muting Rihanna and Commercializing Domestic Abuse," Adia Harvey Wingfield, Racism Review, January 6, 2010. "Race and the Republican Party: The Elephant in the Room," Adia Harvey Wingfield, Racism Review, May 10, 2009. "I, Too, Sing America: A Different Perspective on Obama," Adia Harvey Wingfield, Racism Review, November 10, 2008. No More Invisible Man: Race and Gender in Men’s Work (Temple University Press, 2013). "Are Some Emotions Marked ‘Whites Only?’ Racialized Feeling Rules in Professional Workplaces" Social Problems 57, no. 2 (2010): 251-268. Describes the ways black professionals have to manage their emotions when working in predominantly white work spaces. This study finds that black men in particular censor any expressions of anger, while black women sometimes deploy anger strategically to be taken more seriously. This research also showed that for black professionals, diversity trainings are sometimes more of a source of emotional restraint than a site for meaningful dialogue. Doing Business with Beauty: Black Women, Hair Salons, and the Racial Enclave Economy (Rowman and Littlefield, 2008). Focuses on how working class black women use entrepreneurship as a route to upward mobility. By establishing business models that center explicitly on black women’s unique needs and social standpoints, they experience upward mobility and help other black women do the same.